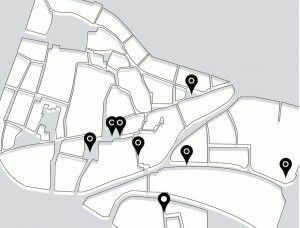 The other city is an project of art and citizen participation, coordinated by Alícia Casadesús and Sol Roca. It was produced with students from different disciplines of the Escola d'Art i Superior de Disseny de Vic, and many people have been involved in a four month process combining training and a real project. The work took into account various aspects of public space: physical, social, political and temporal. Several interventions were raised in areas of the Casc Antic (Old Quarter) and the Barri del Call (Jewish Quarter), using different resources and objectives such as perception, poetry, local history, a critical perspective, the relationship with specific groups of the city or the impact upon those who pass through the city. The ephemeral interventions took place on the last weekend of December in different parts of Vic, and the exhibition is a collection and a documentation of the projects which were carried out. Participants of the project: Amanda Hinojosa, Biel Barnils, Colins Buko, Dolors Garcia, Eduard Puig, Eric Rubio, Janna Locher, Josep Franch, Laura Padrisa, Maria Tuneu, Mariona Piris, Meritxell Prat, Marta Camprubí, Marta Frigola, Mireia López, Montse Poch, Naira Martínez, Olga Guasch, Pau Sardiné, Pol Guinart, Rut Bau, Salvador Plans, Soraya Navarro, Verònica Navarro and Xavier Oró. The other city was promoted by Departament de Cultura i Ciutadania de l'Ajuntament de Vic, with the collaboration of Escola d'Art i Superior de Disseny de Vic, el Col·legi d'Arquitectes, la Farinera, la Universitat de Vic and ACVic Centre d’Arts Contemporànies. Exhibition design by Amanda Hinojosa, Laura Padrisa, Marta Camprubí, Montse Poch, Pau Sardiné, Pol Guinart, Soraya Navarro and Verònica Navarro.